You know that soldiers are made out of tough stuff – if you were to get a bunch of geeks to defend the country’s honor, or to send them out to war, you would most probably end up making plenty of widows in the process, with mourning families in tow. No sir, a country needs a strong army to ensure that one’s sovereignty would not be trampled upon that easily, and churning out a tough batch of soldiers is easier said than done. Well, you might want to have some of these troopers around your home, too, where the £24.99 Soldier Doorstop will not stop advancing enemies, but rather, use their inherent toughness to prevent doors from slamming shut. We know that war is hell, but ensuring that everyone around the home has enough peace and quiet is also important, as slamming doors not only send a shock down the spine of some of the weaker hearts around the home, they are also not too good for the ears in the long run, not to mention you might just have an extremely painful finger or two in the event that your finger/toe is parked somewhere on the doorpost itself by accident when a sudden gust of wind arrives. 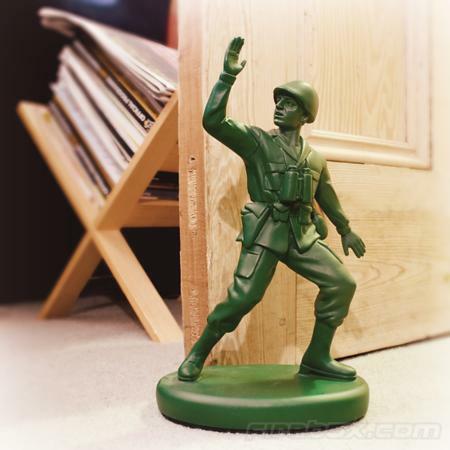 Made from sturdy plastic polyresin, the Soldier Doorstop tips the scales at a solid 1.75kg, ensuring he remains firmly entrenched whenever you place him, without suffering from fatigue or fear round the clock.